An attempt to measure the solar deflection of stars during the August 21, 2017 total solar eclipse to the highest precision ever realized. Commercial equipment today is better than ever! In 1919, astronomers performed an experiment during a solar eclipse, attempting to measure the deflection of stars near the sun, in order to verify Einstein’s theory of general relativity. The experiment was very difficult and the results were marginal, but the success made Albert Einstein famous around the world. Astronomers last repeated the experiment in 1973, achieving an error of 11%. In 2017, using amateur equipment and modern technology, I plan to repeat the experiment and achieve a 1% error. The best available star catalog will be used for star positions. Corrections for optical distortion and atmospheric refraction are better than 0.01 arcsec. During totality, I expect 7 or 8 measurable stars down to magnitude 10, based on analysis of previous eclipse measurements taken by amateurs. 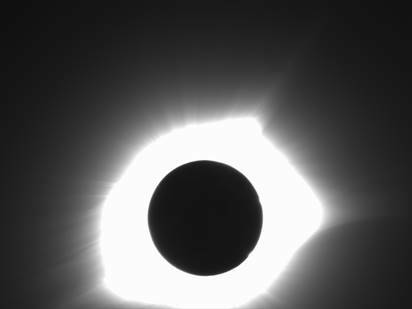 Reference images, taken near the sun during totality, will be used for precise calibration. Preliminary test runs performed during twilight in April 2016 and April 2017 can accurately simulate the sky con­ditions during totality, providing an accurate estimate of the final uncertainty. A feature article for Sky & Telescope Magazine appeared in the August 2016 issue, with additional description on their web site. By subtracting a blurred corona from each of the 34 images (0.62 second exposures), then combining all of them with a small translation, 18 very accurate, but dim, stars are measureable. Combining the 11 shorter images (0.09 seconds) allowed me to measure the two stars that are close to the sun, and use other stars in those mages to get a good alignment. A total of 20 stars are included in my final results. 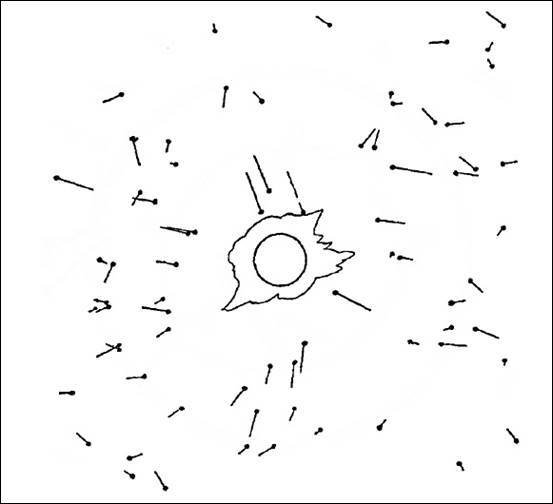 The left figure shows the image with the 0.62 sec exposures, the center figure shows the star positions indicated with the white circles, and the right figure shows the image with 0.09 sec exposure. Based on the location of the two close-in stars, the exposures were just about perfect! Society for Astronomical Sciences, paper and lecture, completed June 2016. Sky & Telescope Magazine, article published August 2016. Sky & Telescope Magazine special Eclipse issue, August 2017. Applied Optics journal articles, published March 2017 and August 2017. Astronomy Magazine list of cool experiments, posted May 15, 2017. Repeat presentation on August 18 at the Lion’s Camp for interested students and astronomers. Final paper in draft form (with small errors to be corrected in the final published paper) is available at arxiv.org. Very nice Tele Vue blog from NEAF, with lots of photos. NEAF talk, April 21, 2018 raw version before editing. See Day 1, third talk. Final eclipse report, 2018, published by Classical and Quantum Gravity, on March 6, 2018 (Vol 35, No. 7, 12 April 2018). 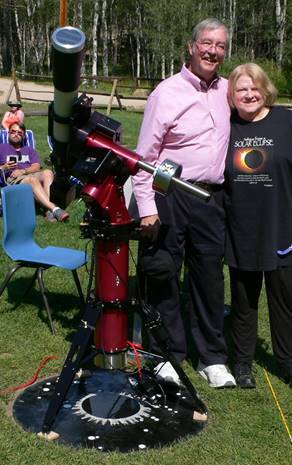 Follow-up article in Sky & Telescope magazine in August 2018, and on their web page at SkyandTelescope.com. Astro-Imaging Channel on YouTube, discussion of my experiment by Bob Denny, author of one of the software packages I used. He talks about my experiment for 7 minutes. A German astronomy web blog, with an article in the September 2018 print issue. Physics Today had a 1-year anniversary summary of Eddington’s experiment, featuring my results. Science News had a 1-year anniversary summary of Eddington’s experiment, a shorter version of the Physics Today blog. Discussed in an interview by Prof. Duncan (CU-Boulder) on Colorado Public Radio. Included in “Theory and Experiment in Gravitational Physics” (Second Edition), a book by Clifford Will, published in 2018. Included in O Eclipse de Einstein [Einstein’s eclipse], a book by Prof. Nuno Crato and Prof. Luís Tirapicos, to be published in 2019 in Portugal. Invited lecture at the American Association of Physics Teachers conference in Houston in January 2019. Invited lecture at the American Physical Society conference in Denver in April 2019. Possible mention in IMAX Einstein documentary movie 2019. 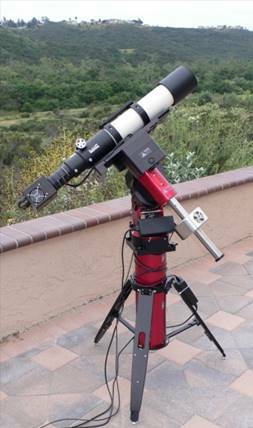 Al Nagler, Tele Vue Optics, Inc., for loan of the NP101is telescope and optical raytracing. Greg Terrance, Finger Lakes Instrumentation LLC, for loan of the ML8051 CCD camera. Stephen Bisque, Software Bisque, Inc., for loan of the MyT Paramount tripod. George Kaplan and John Bangert, both formerly of USNO, for astrometric advice and help with NOVAS. Norbert Zacharias, USNO, for astrometric advice. This research has made use of FORTRAN version of NOVAS, the Naval Observatory Vector Astrometry Software package. This research has made use of the VizieR catalogue access tool, CDS, Strasbourg, France. The original description of the VizieR service was published in A&AS 143, 23. Suresh Rajgopal, for help in setting up gfortran. Corey Bruns, for help in automating the data analysis with linear algebra advice. Ted Pecoraro, for help in improving the Paramount field tripod feet. Steve Lang, for help setting up in Wyoming. Jerry Kassebaum, for suggesting locations near Casper. Greg Kinne, for help in scripting TheSky. Ron Bruns, for calibrating weather instruments and operating an auxiliary experiment. Thank you for your interest in Stellar Products! All text and images are owned by Stellar Products, 1992-2018. Any use by others without permission of Stellar Products is prohibited. For information on commercial use of any of these images, click here. Web page last updated August 21, 2018.